Why is Protecting Medicaid Important to Long-Term Care Consumers? Congress and President Trump face the difficult challenge of coming to agreement on a balanced approach to reducing our nation's deficit. Undoubtedly, tough budgetary decisions will have to be made in the future to resolve the fiscal issues our nation is facing, but one thing is certain: we cannot allow any budgetary agreement to harm long-term care consumers' access to needed services! We must ensure that strong federal funding and the traditional structure of the Medicaid program - the largest single payer of long-term care in our nation - is preserved in any proposed budgetary deal. Implementing large-scale funding reductions to Medicaid would harm consumers' access to long-term care and the quality of care that consumers receive in nursing homes and other long-term care facilities. Check back with us for updates! The US House of Representatives has just issued a proposal to change the Medicaid program by going to a system of per capita caps. The proposal is part of a bill, H.R. 277, to replace the Affordable Care Act. These changes to Medicaid would be devastating to nursing home residents and other long-term care consumers. Fewer people would receive nursing home care even if they needed it. States are likely to eliminate coverage they are not required by the federal government to furnish – such as bed hold coverage for hospitalization and therapeutic leave. Urge Congress to preserve Medicaid by rejecting any budgetary proposals that would harm the traditional structure of Medicaid or reduce federal funding for the Medicaid program! Read Consumer Voice's fact sheet on the dangers of Medicaid per capita caps. Click here to send an editable message to your Member(s) of Congress! Call Congress to advocate for protecting Medicaid! Contact the U.S. Capitol Switchboard at (202) 224-3121 and ask for your senators' and/or representative's office. Urge your family, friends, and fellow advocates to do the same! Listen to Consumer Voice's Pep Rally Webinar on How to save Medicaid for Long-Term Care Consumers below. Download the PowerPoint slides here. Access our sample messages you can use when talking to legislators. How is Medicaid important to you? Tell us your story! We have prepared questions to answer yourself or to guide an interview with someone else. There are questions for three settings: a nursing home, an assisted living facility and at home. Online using our online story form. Click here. Recording a video. For instructions on how to share your video with us, click here. We must have a signed consent form in order to use your story. Read stories about consumers' and family members' experiences here. Medicaid is a national public health insurance program funded by both the federal government and states and operated at the state-level. Medicaid pays for health services and long-term care for low-income Americans, including the elderly and persons with disabilities. To qualify for Medicaid, individuals must meet certain income limits set in place by the federal government and by states, as well as other requirements. Although Medicaid is operated at the state level, every state Medicaid program must comply with federal statute and cover certain mandatory services. However, states can choose additional services to include under their Medicaid programs. Approximately 70 million Americans rely on the Medicaid program for the care, treatment and services they need, including long-term services and supports. Medicaid Remains the Largest Single Payer of Long-Term Care in Our Nation: Medicaid is the primary payer of long-term services and supports, accountable for nearly half of all long-term care financing and covering nearly half of all nursing home expenditures. Sixteen million seniors and people with disabilities—1 out of every 4 people—rely upon Medicaid for their long-term care needs. Any funding reductions made to the Medicaid program would hurt these individuals. Medicaid is the Only Way Most People Can Afford Long-Term Care: Long-term care is extremely expensive. According to Genworth Financial, the average annual cost of nursing home care was $92,378 for a private room and $83,125 for a semi-private room. Few people can afford these rates for very long or at all. If they don’t have enough money or run out of money, many individuals will turn to Medicaid for assistance. For these consumers, Medicaid is the only option for receiving the long-term care they need. Medicaid Allows Long-Term Care Consumers to Stay in Their Homes: Medicaid helps nearly one out of three individuals stay out of nursing homes and receive the services and supports they need at home. It continues to play an important role in strengthening consumer access to home and community-based services through various grant programs and waiver options, such as the recently authorized Community First Choice option that grants states the ability to provide long-term services and supports to Medicaid beneficiaries with disabilities. Medicaid Pays for Services Not Covered by Medicare and Private Insurance: Unlike Medicaid, Medicare and standard private insurance plans do not cover ongoing long-term services and supports such as helping someone to dress, bathe, walk, eat, take medications, prepare meals, do the laundry and shop for groceries. In fact, Medicare only pays for a very small amount of nursing home care – and does not pay for assisted living at all. Although there are a limited number of private long-term care insurance plans that do cover these services, fewer than 10% of older adults have purchased such policies. For these reasons, Medicaid remains the only coverage option for the majority of individuals that cannot afford to pay out-of-pocket for long-term care. Without the Medicaid program, many of these consumers would go without needed care, or the financial burden of providing care would be placed on family caregivers and loved ones. Medicaid Helps to Ensure Safety and Quality in Our Nation's Nursing Homes: Medicaid establishes standards for nearly 16,000 nursing homes and requires annual inspections that help to protect some of our most vulnerable citizens. Nursing homes that want to begin or continue participating in the Medicaid program are required to meet certain regulations put in place by the Centers for Medicare and Medicaid Services (CMS), known as Requirements of Participation. These rules play an integral role in helping to protect and ensure quality of care and life for residents over the past twenty-five years, and nursing homes are normally inspected once every 9 to 15 months to ensure compliance with these regulations. Decreasing Medicaid funding would reduce inspections and quality assurance in nursing homes, increasing residents' susceptibility to neglect and abuse. Furthermore, reductions in federal funding for Medicaid would likely result in less staffing at long-term care facilities and even lower worker wages, both of which would undoubtedly compromise quality of care. Ohio: “Seniors and disabled people on Medicaid/Medicare are already at poverty level. Long-term care facilities already spend as little as possible on their residents. If Medicaid/Medicare and Social Security are reduced, the care for these people will only get worse. It's a tough fight getting facilities to pay for what the law says they should provide for these people now. Reducing benefits will make it harder to get good care for our long-term care residents." "Dangers to Long-Term Care Consumers," a policy briefing from Consumer Voice, reviewed how nursing home residents, other long-term care consumers and their families are facing very serious threats. 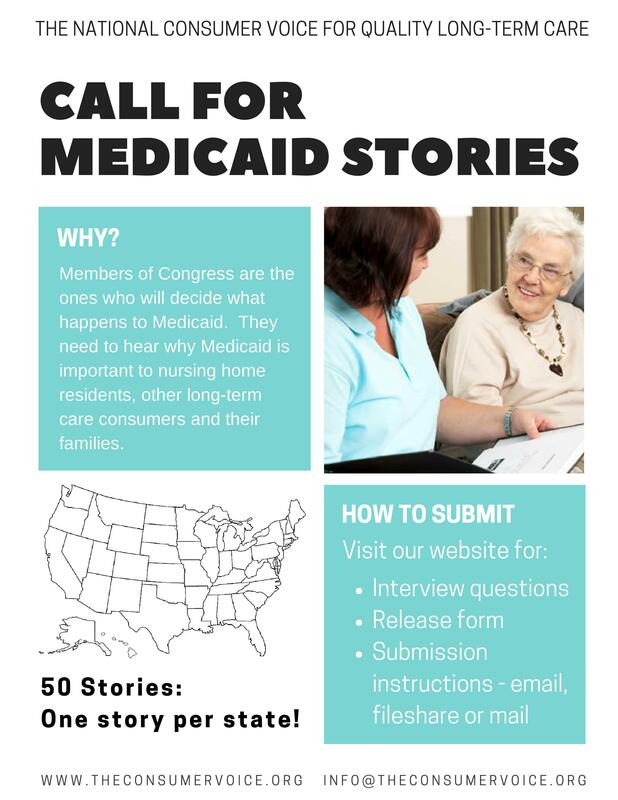 The briefing provided information on proposed changes to Medicaid that would impact both access to and quality of long-term care and a bill that would severely limit the ability of injured consumers and their families to hold nursing homes, assisted living facilities and other health care providers accountable. Hear from experts on these issues and what YOU can do. The one-stop-shop for long-term care information.